8.-18.Jul 2016 Arctic cruise around Spitzbergen in 10 days leaving Longyearbyen on Spitzbergen and ending 10 days later in Tromso Norway. Perfect location of the room (#317). One floor above the door to board the Zodiacs (and where we had our Zodiac life west as well as our boots), same floor for main Marco Polo Dining room (free seating) and small shop, one floor up to the Explorer Lounge (Dance room and presentations) as well as to the self-service Restaurant Lemaire and 3 floors up for the Observation desk Bar. 2 Elevators (seldomly used). 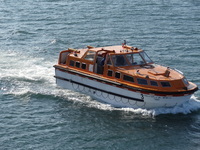 Small cosy ship with max 175 People and 120 staff. Extremely helpful and friendly staff. 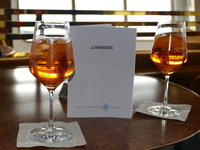 Dining: Marco Polo: Set choice Menue for lunch and dinner (separate Manue available of offered choices did not convene) Lemaire is a buffet style Restaurant for Breakfast, lunch and dinner. Excellent Food in both Restaurants. Alcohol in all Restaurants and Bars was included in our tour package since it was entirely chartered by a Swiss travel agency. Special flights organized as well from Zurich to Longyearbyen (almost 5 hrs) and back from Tromso to Zurich (almost 4 hrs). Entertainment: 2 piano players (the nature and the excursions were the Entertainment we were looking for) Service: Very helpfull and professional. The staff knew our coffee and water wishes as from the 3 day on. Daily rooms cleaning was fast end efficient (during breakfast). 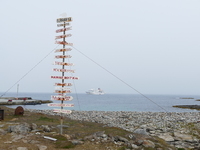 Ports: Left in Longyearbyen (a village with approx 2&apos;500 inhabitants) but with an Airport with a runway of 2500 meters capable to accept Airbus A-321 aircraft). 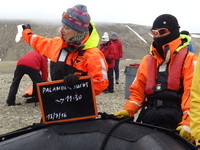 Did many Zodiac excursions and landings but except for Ny Alesund (a village of approx 150 People) no real ports to stop). 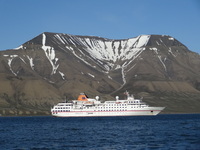 Tromso was choosen to refill the ship, since it was easier and cheaper to bring new Food on boad from the Norwegian coast than flying it up to the arctic Island). on main deck there was a heated Swimming pool and a jacuzi. The pool had carrebian water temperatures, so it was fun have have a swimm next to the arctic glaciers. 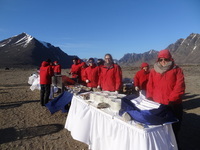 We also had a picnic on one of the Islands where table, food, drinks etc was brought ashore and where they served a barbeque for 170 People at its finest. Compliments!!! Would we go again: ANYTIME!!!!! 8.-18.Jul 2016 Arctic cruise around Spitzbergen in 10 days leaving Longyearbyen on Spitzbergen and ending 10 days later in Tromso Norway. Perfect location of the room (#317). One floor above the door to board the Zodiacs (and where we had our Zodiac life west as well as our boots), same floor for main Marco Polo Dining room (free seating) and small shop, one floor up to the Explorer Lounge (Dance room and presentations) as well as to the self-service Restaurant Lemaire and 3 floors up for the Observation desk Bar. 2 Elevators (seldomly used). Small cosy ship with max 175 People and 120 staff. Extremely helpful and friendly staff. 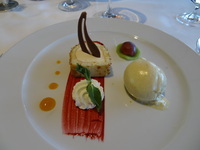 Lemaire is a buffet style Restaurant for Breakfast, lunch and dinner. Excellent Food in both Restaurants. Alcohol in all Restaurants and Bars was included in our tour package since it was entirely chartered by a Swiss travel agency. Special flights organized as well from Zurich to Longyearbyen (almost 5 hrs) and back from Tromso to Zurich (almost 4 hrs). Service: Very helpfull and professional. The staff knew our coffee and water wishes as from the 3 day on. Daily rooms cleaning was fast end efficient (during breakfast). Ports: Left in Longyearbyen (a village with approx 2&apos;500 inhabitants) but with an Airport with a runway of 2500 meters capable to accept Airbus A-321 aircraft). 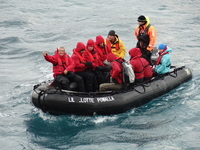 Did many Zodiac excursions and landings but except for Ny Alesund (a village of approx 150 People) no real ports to stop). Tromso was choosen to refill the ship, since it was easier and cheaper to bring new Food on boad from the Norwegian coast than flying it up to the arctic Island). 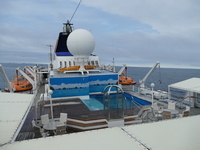 on main deck there was a heated Swimming pool and a jacuzi. The pool had carrebian water temperatures, so it was fun have have a swimm next to the arctic glaciers. We also had a picnic on one of the Islands where table, food, drinks etc was brought ashore and where they served a barbeque for 170 People at its finest. Compliments!!! Would we go again: ANYTIME!!!!! 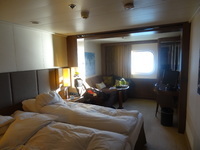 3rd floor Outside cabin with 22m3 with a large window, sitting area, with Cocktail table, chair and desk with large mirror, Refrigerator with free non alcoholic beverages replenished every day. Bottle of champagne per Person including ice bucket and drawer with a choice of glasses. Two bed, plenty of storage room for Cloth and jackts. separate storage space for life jackets. Decently large Bathroom with nice shower (glass wall instead of shower curtain). Excellent daily cabinservice and replenishment of all bathroom ammendities.